Edmond Sumner (left) and forward Alize Johnson are back with the Mad Ants. 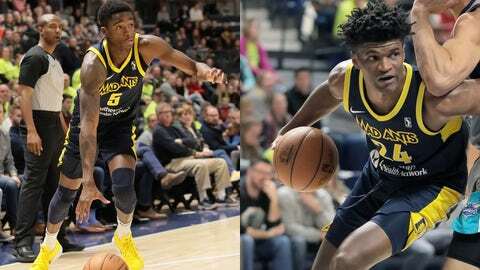 Guard Edmond Sumner and forward Alize Johnson, who haven’t been seeing much court time with the Indiana Pacers, have been assigned to the club’s NBA G League affiliate, the Fort Wayne Mad Ants. Johnson, 22, has played 11 games for the Pacers, totaling six points and eight rebounds in those games. He is averaging 19.2 points and 13.6 rebounds per game over 25 appearances with the Mad Ants. Sumner, 23, has gotten a little more action with Indiana, totaling 41 points, 19 rebounds and eight assists in 19 games. He has played in 20 games for Fort Wayne, averaging 23.8 points, 2.6 rebounds and 3.7 assists.